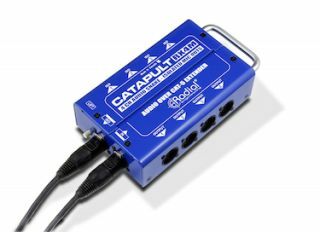 The What: Radial Engineering has unveiled its Radial Catapult, a four channel audio snake that lets users send analog and AES digital audio signals over standard cat-5 shielded twisted pair cable. The What Else: Using cat-5 enables system contractors to take advantage of pre-wired networks to connect one room to another and allows stage techs to take advantage of the relatively low cost of the abundantly available cable for return snakes or for transporting channels of balanced audio across a large stage. The Catapult design relies on a heavy steel construction made to handle the rigours of live touring along with a heavy duty powder coat finish to keep the Catapult unit looking good for the long haul. A Protective bar around the connectors keeps things safe while providing a handle for carrying. The Bottom Line: Prices have yet to be finalized. Delivery anticipated by December 2015.